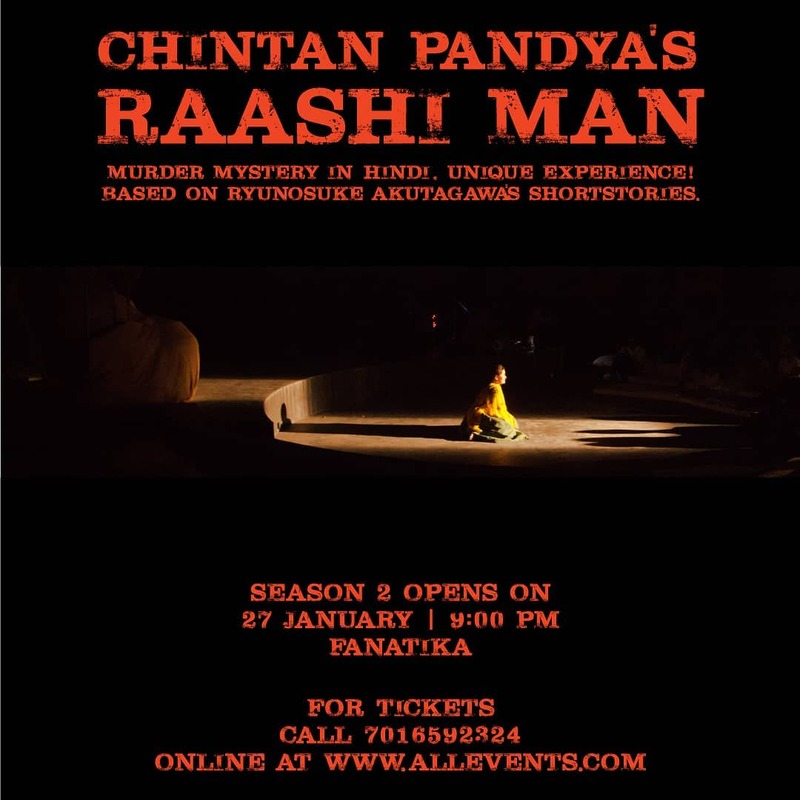 Chintan Pandya’s “Raashi Man” is a musical inspired from Ryunosuke Akutagawa’s short stories ‘In a Grove’ and ‘Rashomon’. The play is set in the 1850’s in Uttrakhand, India. The Japanese short stories have been portrayed in an Indian context – both culturally and linguistically. The story revolves around a horrendous and mysterious murder. The unusual aspect of the play is the stark difference between all testimonies presented in the court trial. Who speaks the truth? Which version is the truth? Do ghosts speak the truth? Could there be more than one truth? Come and explore the testimonies to find out for yourself what “could be” the truth! The concept of environmental theatre is to heighten the experience of the performance by eliminating the distance between the audience and the performers. Emerged as a branch of New Theatre Movement during the 1960s, Environmental Theatre goes on to adapt to any site of performance that may or may not be built with the intention of serving theatrical purposes. For example, in courtyard, hotel or a converted building, even a forest can be converted into a performance space. This style of performance is more interactive and intimate than conventional theatre. The sole purpose of this kind of theatre is to engulf the audience into the environment of the play and this can be achieved anywhere, whether it’s a large proscenium hall or a street or a converted warehouse. The term is used to express different contradictory interpretations of the same incident. It deals with the nature of the truth, how different people with different backgrounds, expectations and experiences witnessing the same incident as others; perceive the situation in a completely different manner.